All things GREEN, a trend we adore! Green can be gentle and natural or bold and impactful. Make it your own and add a little flourish with our greenery inspired ideas. One of our favourite shades of Vintage Paint at the moment is the subtle Artichaut. The palest of greens, a smokey grey-green which is fantastic on walls as well as on furniture—we’ve painted some of our new café dining chairs with it. Main photo with painted chair: Vases and planters 5.50 - 14.95 each. Artificial succulent, 12.50 and potted cactus, 25.00. Velvet cushions, 27.50 each. 1. Artificial greenery, cheese plant stem, 7.50. 2. Tall stem vase, 14.95. 3. Etched green wine glasses, 7.95 each. 4. 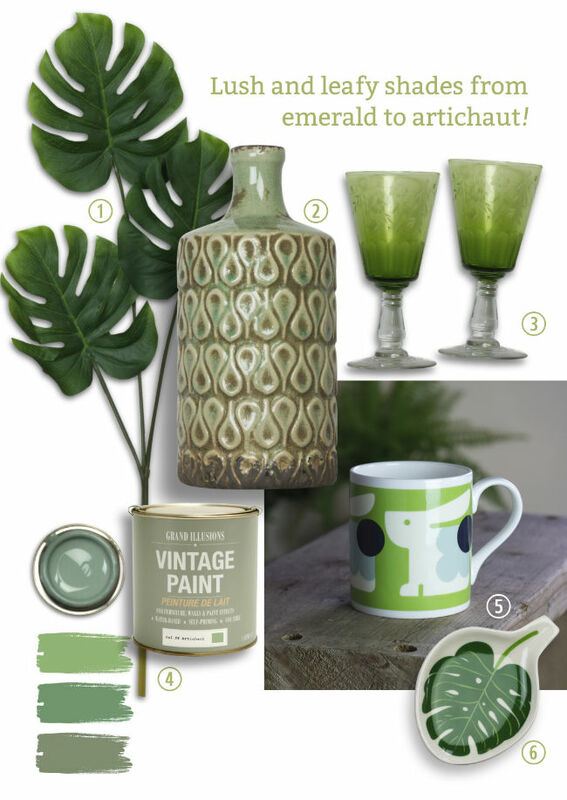 Vintage Paint in shades, Artichaut, Verde, Verdigris and Charleston, 6.50 125ml, 18.99 1L. 5. Orla Kiely mug, 9.95. 6. Caroline Gardner Tropical Leaf Trinket Bowl 9.50.